So as cool as Interest, Behavior and Demographic targeting is, it gets oh so much cooler and more powerful if we go a bit deeper. Under the "Audience" tab in Power Editor, you'll see a green button on the top right side which says "Create Audience." I highly recommend you click that button. 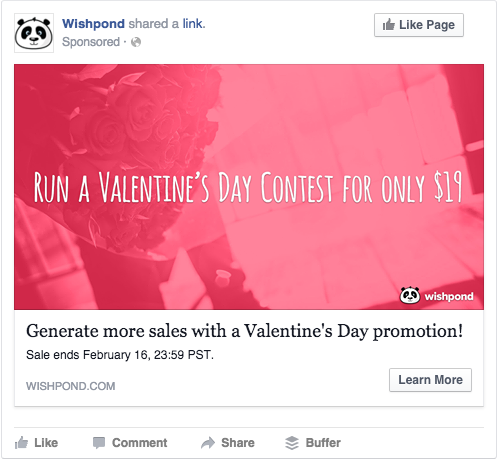 Advanced Facebook Ad targeting allows you to hone in on people who have specific relationships with your company. And because everybody's on Facebook you can reach them in a whole new dynamic way which, until about 3 years ago, was completely impossible. 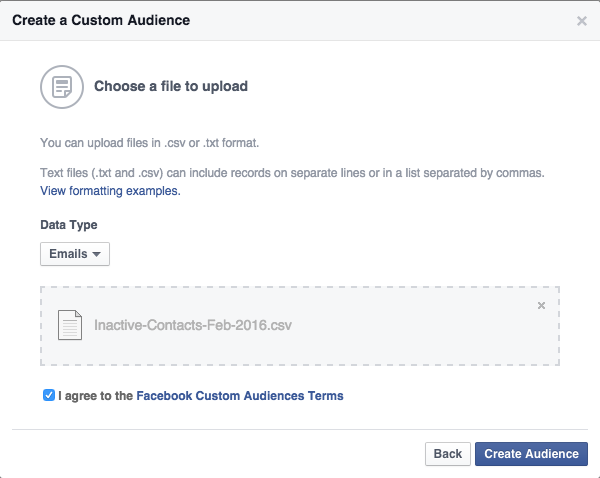 Custom Audience - Customer List targeting allows you to create a specific Facebook ad audience made up of your email list. Essentially, you can drag and drop an email list (CSV file) into Power Editor and Facebook will cross those email addresses with that of its users to create a highly specific ad audience. Segment your existing user-base into actives (people who have bought, subscribed or done some other action in the past few months) and non-actives (people who haven't). In order to re-engage with your non-actives, create a limited-time promotion on your product. Doing this allows you to promote your campaign not just to that segment of lists via email (where they may have blocked you, unsubscribed, or sent you to their spam folder) but also on Facebook. And, if you pay CPC, I doubt you'll be spending more than a few bucks to do it. Lookalike audiences require a custom audience to be created first, as they are actually generated from that list of Facebook users. Essentially, Facebook (totally automatically, of course) takes a look at the profiles of your custom audience Facebook users and finds other Facebook users like them, in terms of interests, demographics, and more. The specificity of your lookalike audience is based entirely on the percentage of the country you choose to search. 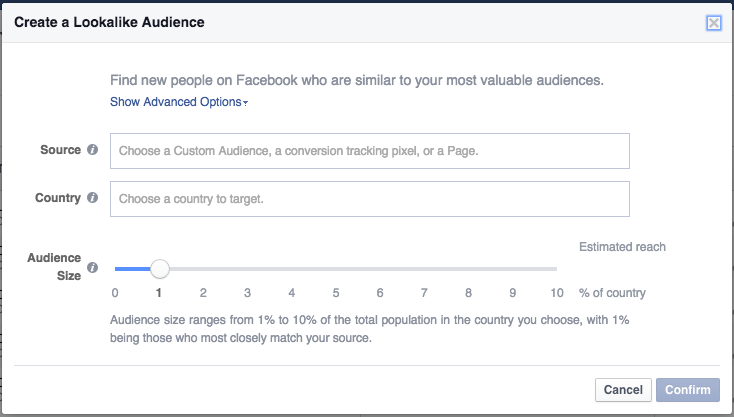 1% of your targeted country will result in the top 1% of people most like your custom audience. Choosing 10% will result in a larger but less specific audience. Another great way to use custom audience targeting is to paste all of your contacts into Facebook and then target them with a "You already subscribe to my newsletter, why not Like my Facebook Page?" campaign (remembering to exclude people in that audience who are already connected to your Page, of course). Once you've run a few of these campaigns over the course of six months or so, you'll have increased your Facebook Page Fans considerably and driven the engagement of all of your business' contacts. Once you're confident that the majority of your contacts are also Fans, run Facebook's lookalike audience program against your complete custom audience - this will enable you to uncover Facebook Users who are not only likely to become leads, but will also be interested in becoming a Fan of your page. 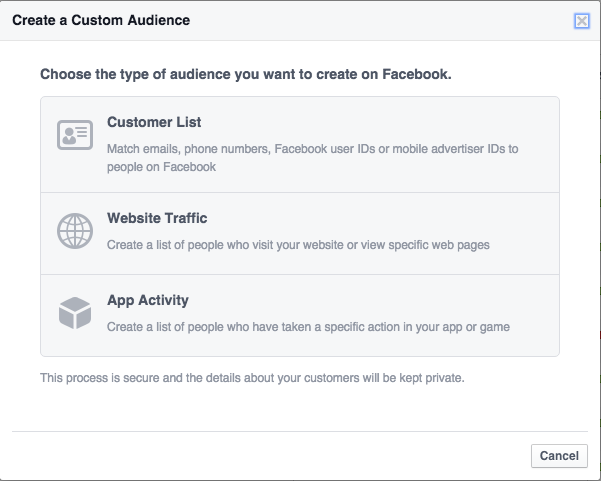 Custom Audience - Website Traffic is the newest advanced targeting tool in the Facebook Ads arsenal. If you're familiar with remarketing on Google, this will all be pretty familiar. Website Custom Audiences (WCA) allow you to focus an entire ad campaign solely on people who have visited your site. If they visit a page of your website (but not another, like your product page but not your checkout page, for instance) then you can show them ads designed specifically to drive them back to your site and to re-engage. Add the WCA pixel into your site (or at least onto your homepage, product pages, checkout and "thank you" page). When someone comes to your site and puts something in their checkout cart but doesn't complete the purchase (i.e. doesn't visit your "thank you" page), trigger your remarketing campaign. As you know that the primary reason people don't complete an ecommerce purchase is price (either surprise taxes or shipping fees), create a Facebook Ad promoting a 50% off coupon or "free shipping on purchases over $25." This effectively addresses this specific potential customer's pain points and drives them back to your site to finish their purchase.